What Happens if There is a Power Outage at Your Place of Business? 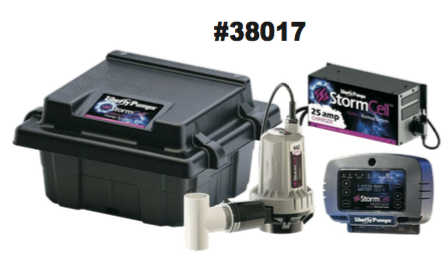 The Stormcell™ Battery Backup Pump by Liberty Pumps provides uninterrupted flood control for basements during power outage or main pump failure. It is one of the most advanced pump systems on the market, and features high output pumping, an energy efficient DC pump for longer run times, and professional grade charger and controls. It also includes high performance 12-volt batteries that are made in the USA and designed for optimal performance in back-up pump applications. Install a backup pump system at your place of business and feel secure knowing that you have a fail safe plan in case of emergency. Control Panel features a super bright LED alarm ring to notify backup pump is in use. Other notifications include: high water, AC power lost, Blown Fuse/DC pump failure, 12-volt battery charge levels, critically low battery warning, and user set basement temperature warning. View the Stormcell Back-up Battery Pump on Equiparts.net (EC Part #38017) to learn more about it, then give us a call to place your order learn more and be prepared in case of power outage! To order, call us toll-free at 800-442-6622 Monday-Friday, 7:30AM-5:00PM or submit a quote on our website. You can also share or download our Stormcell Battery Backup Pump PDF.